Cone crusher is a kind of mechanical equipment commonly used for crushing ore. In the ore crushing production line, the cone crusher is often used for medium and fine crushing of ore, which plays a very important role in the production and processing of sand and gravel. 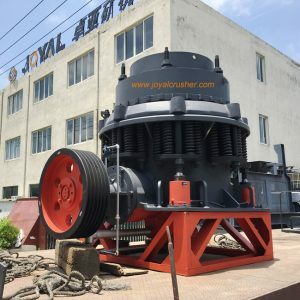 Shanghai Joyal Mining Machinery here and everyone talk about the state of the cone crusher can start the ore crushing process, how to make the cone crusher in the better processing of the ore. The optimum operating conditions for the cone crusher are that the crushing chamber level is located 300 mm above the dispensing tray. This condition is called “filled feed conditions.” Under such conditions, it can be ensured that the cone crusher feed is evenly distributed around the crushing chamber and the power can be prevented from reaching a sharp peak due to the slight change of the feed amount. The alternate ultrasonic cavity level converter can be used to detect the level of the crushing chamber or as an input signal to the cone feed control loop. The cone crushing chamber selection switch (moving cone and fixed cone lining) and the tight side discharge opening can create the crushing machine “packed feed” operating conditions and make the stable driving power between 75% and 100% of the rated power. . Once the cone crusher is fully loaded, the crusher discharge port can be used to optimize the drive power. Increasing the crusher discharge port will reduce the drive power of a given break chamber level and increase the same crush chamber level. The amount of feed required. Of course, a smaller discharge opening means that the size distribution of the material broken by the cone crusher should be adjusted to a smaller scale. The cone crusher discharge port system is adjusted by a hydraulic motor. The hydraulic motor type adjustment mechanism designed by the cone crusher can be adjusted when feeding and not feeding. When the crusher is operated, the system can be used to adjust the discharge capacity of the crusher discharge port and the crusher.